1. The first devices looked like pagers (RIM Inter @ ctive Pager 950) with a large screen. The main function is instant corporate communication. Company Research in Motion was founded in 1984 by a group of enthusiasts who developed the Budgie system. The system allows you to wirelessly display on the TV screen the text typed on the keyboard console. By the end of the decade, pagers got a browser and e-mail, and by the beginning of the next - a module for voice calls; in other words, RIM-perhaps, without realizing it - released a smartphone. 2. Service of monetary applications. 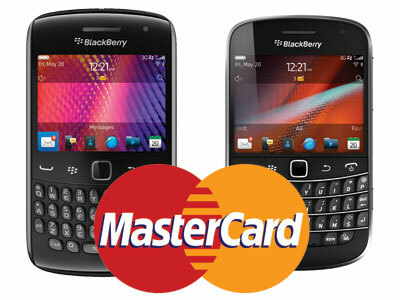 Smartphones of Research in Motion (RIM) BlackBerry Bold 9900 and BlackBerry Curve 9360 became the first NFC-smartphones that received the MasterCard PayPass certificate. Thanks to the certificate, any bank issuing MasterCard PayPass cards can create a Paypass account on the SIM card of these smartphones. According to MasterCard, BlackBerry devices meet all the functionality, interoperability and security requirements required to obtain a Paypass certificate. 3. BlackBerry is recognized as the safest mobile platform. Operating system BlackBerry confidently topped the rating of the most secure mobile platforms with a result of 2.89 points. In second place with a large gap from the BlackBerry is iOS, which managed to score only 1.70 points, and the third was the operating system Windows Phone 7.5, received 1.61 points. As for Android 2.3, this platform gained 1.37 points and took the last place in the ranking. 4. BlackBerry in the world of stars. What do you think that brings together celebrities like Eva Mendes, Adam Brodie, Cameron Diaz, Miley Cyrus, Lindsay Lohan, Willayam, Madonna, Chris Brown, Britney Spears? All of them have something small and special, without which they do not see their life. No, this is not a highlight, but a BlackBerry®. 5. 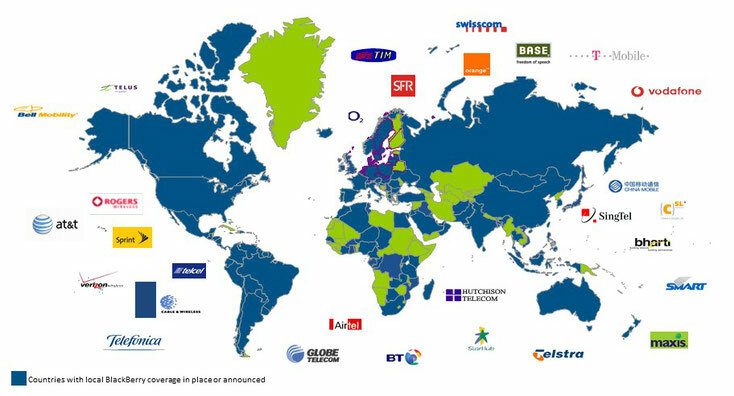 Representation of BlackBerry: Africa, Asia-Pacific, Caribbean, Europe, Latin America, Middle East. 7. Advantages of working with BlackBerry. Ability to use up to 10 e-mail mailboxes on one device, working on the basis of Push e-mail technology. Push e-mail technology is based on the use of its own BlackBerry servers located in England and Canada. 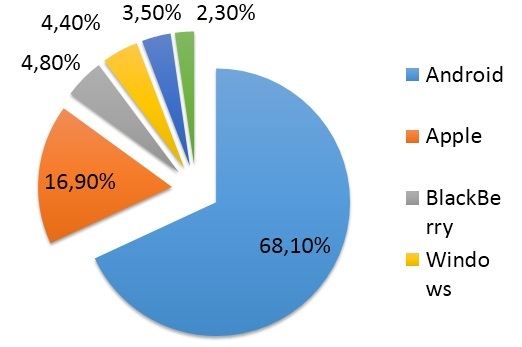 Direct synchronization of the BlackBerry smartphone and mailbox is not, which significantly saves the battery life of the BlackBerry smartphone. In addition to the built-in application store, the BlackBerry allows you to install third-party software both over the air (OTA, Over The Air), and using a computer. Thus, there is no need for procedures such as JailBreak. Using the technology of data compression - all this allows to increase the operating time of the device without recharging, on average 2-3 days without recharging in the mode of active use. In smartphones BlackBerry built in its own browser, which significantly speeds up. use of the Internet. It allows you to surf the sites always and everywhere. You gain access to search engines, you can visit selected sites, store archives of messages and leave your bookmarks, open links from messages with a single click, use navigators and maps, and customize RSS feeds. Smartphones BlackBerry c OS 7.1 are equipped with the ability to browse and listen to songs online. With your smartphone you can watch your favorite TV show, even being far from the TV. Built-in mobile access point, NFC technology. Your information is securely protected, as it is delivered to you through a reliable BlackBerry® server using data encryption technologies. 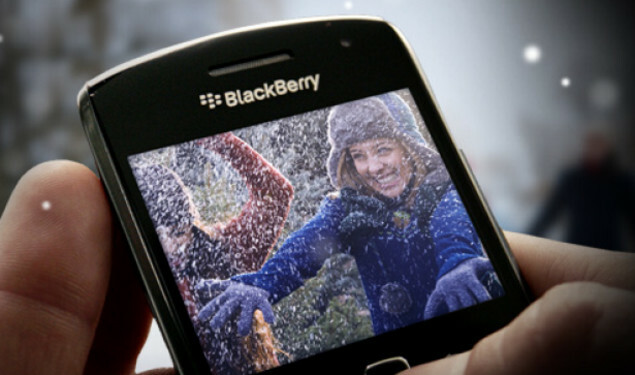 The best work in conditions of poor coverage of the cellular network - thanks to the technologies of BlackBerry®, fewer data are transferred to smartphones when delivering letters and opening attachments. Excellent sound quality, convenience in working with the organizer, notices that none of the current devices on the market can boast. In the case when the energy of the battery is not enough to work in the network, it will be possible to view contacts and saved messages. The ability to view files of popular formats Word, Excel, PowerPoint (PPT, PPS), Corel WordPerfect, Adobe Acrobat (PDF), TXT, CSV, HTML, ZIP, images (JPG, JPEG, PNG, BMP, GIF), fax formats (TIF , TIFF) and WAV audio files. Removable battery. The ability to replace the battery if necessary. BlackBerry smartphones use standard connectors for connecting devices. BlackBerry smartphones are made of quality plastic, manufactured in Hungary, Mexico, Canada, Taiwan. Strict quality control. Unlimited Internet throughout Russia without the speed limit and the amount of traffic when connecting to the BlackBerry® Internet Service. Universal search - you can enter the name of the contact in the smartphone, and you get not only contact information, but also information about past messages, meetings, notes associated with this contact calls, and the ability to continue to search the Internet with a single click. The highest quality of sound transmission - special technologies allow you to hear without interruption your interlocutor in a noisy room, and noise reduction will allow the interlocutor to hear you. Customizable warning light. You can set a certain light signal to different groups of contacts: family, friends, work, etc. The use of light warning also allows you to not reach the phone from the cover to determine the presence / absence of new messages. "Smart" case BlackBerry. Thanks to magnetic sensors, the phone distinguishes between "in the case" and "not in the case". This feature is so convenient that the phone is usually used in a case, saves battery power.